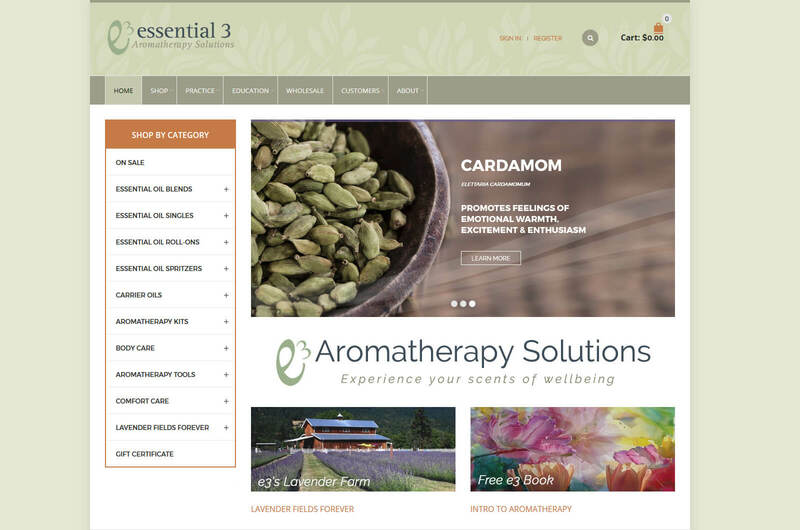 Essential 3 is an incredible essential oil company based right here in the Rogue Valley! At the helm is the talented team including CEO and Clinical Aromatherapist, Caryn Gelman, healing arts practitioner Lakita Dunkers, and IT Director / Registered Nurse Andrew Sanis. Their passion is to provide therapeutic quality essential oils that are affordable. The team is incredibly knowledgeable, and they offer expansive educational information and superior customer service. Quality is paramount, and e3 uses an independent lab who ensures the oils are genuine, un-adulterated, and pesticide free. Visit the site to see their enormous offering of essential oils! Plus read the content rich articles which offer advice on everything from essential oil home cleaning remedies to help with animal care and more. This website includes programming by Happy Dog Web Design, copy-writing from Jennifer Odear at Internet Writing Pro, and the hard work of multi-talented e3 staff.